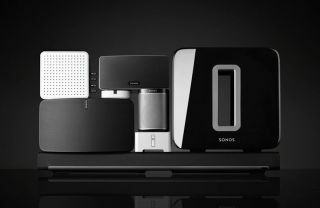 Sonos set to announce big changes on 30th August | What Hi-Fi? Multi-room specialist Sonos has sent out invitations for an event in New York at the end of August. Software updates are expected to take centre stage, with voice control high on the agenda. Business Insider quotes someone “familiar with the company’s plans” as saying Sonos will unveil its plans to implement voice control technology into its wireless speakers. Sonos’s current range of speakers don’t have built-in long-range microphones, so it’s unlikely you’ll be able to control them in the same way as Amazon’s Echo speaker, but instead you’ll be able to speak into your smartphone to carry out commands. In March this year, Sonos announced it would be letting some staff go to restructure the company to focus on voice control technology. The other big announcement at the 30th August event is said to focus on how third party apps integrate with the speakers. Currently, you have to use the Sonos app and add the music services you want to be able to use with it, such as Spotify and Apple Music. But if Business Insider’s sources are correct, you’ll soon be able to use the dedicated music apps to send music to Sonos speakers. So instead of going into the Sonos app to play Spotify streams, you can use the Spotify app instead. With two weeks to go until the event, we’ll bring you any further news as and when we hear about it.